The 4th step was to create our new MAKO SPEARGUNS YAMAMOTO REEF CAMOUFLAGE pattern for designed specifically for reef and kelp hunting. I'm a convert to open cell and Mako wetsuits! I get cold easily, so for me the warmth and comfort is worth the extra care and effort. I got the 7mm open cell Mako suit a few weeks ago and first tried it in a 62 deg outdoor pool. The week before I had tried a 7mm semi dry scuba suit in the same pool when the water was warmer, 64 deg. I was very noticeably more warm and comfortable in the Mako suit than the scuba suit, even though the water was colder. I have since gone diving in a lake that was in the high sixties and the suit was great. I'll be using it again this weekend and the water will likely be in the mid-sixties. I need help getting the suit off - my fat head has trouble fitting through the neck part of the suit - so my main advice is, in addition to always having a buddy when you dive, always have a buddy around to help you take off the suit! At least while you're still new to taking off open cell wetsuits. Good fit, really easy to don and doff, really comfortable and warm! Highly recommend. I've only taken it out for two dives thus far, so can't say much about longevity, but so far I'm really happy with the purchase. I have a women's Small 7mm for diving along the Northern California coast. In 46*- 55* waters, I have been super toasty. I'm 5'6" / 120ish lbs / 26" waist / 34" bust / long torso / slim-athletic build. Based on the size chart, my husband surprised me with a medium (unfortunately too big). The waist sagged, the shoulders gapped a bit when I moved. 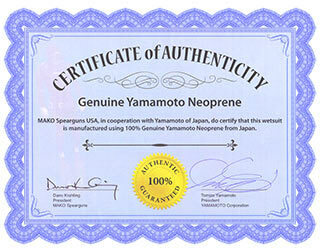 I contacted Mako and they offered to swap it for a small. I was a bit concerned about height fit of the small, I needn't have. The suit fits perfect and provides great mobility. I imagine the pants don't sit quite where they're meant to (directly under bust); but even when wet, the pants don't sag and the beaver tail doesn't tug (cause long torso). I wear mine with Tilos velcro closure gloves and AquaLung SafeSole in 6.5mm and don't have any issue with exposed skin. BASICALLY: quality suit, fantastic customer service, ask a friend of similar measurements before you buy (size chart led me a little wrong). You won't regret the purchase. 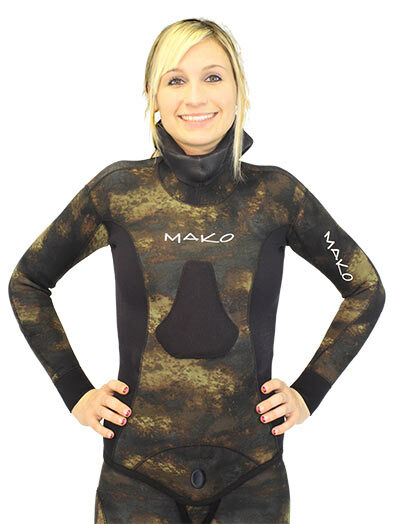 Bought a women's small wet suite for my daughter using the size measurement guide provided by Mako. The fit was GREAT! Was able to share the underwater world with my daughter in cold water (52F). She was comfortable and warm while we were out - I couldn't be happier. Mako customer service was excellent---received prompt e-mail with tracking # for order...great products and great service!